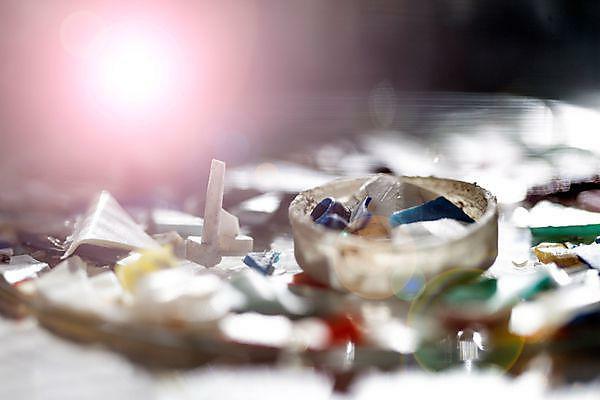 Research at the University of Plymouth was the first to demonstrate the widespread occurrence of microscopic particles of plastic debris in the environment. Work led by Professor Thompson showed that particles which he described as ‘microplastic’ had accumulated in the oceans since the 1960s and were now widespread. His team have since showed that marine organisms ingest and retain this material and that upon ingestion microplastics have the potential to release chemical contaminants. This research has directly contributed to EU policy as part of Marine Strategy Framework Directive (MSFD) and on-going work on microplastics, funded by Defra, aims to establish the potential for this material to cause harm in the environment. More broadly our work has also informed strategies to reduce the quantity of plastic in the environment and to seek more sustainable solutions to the production, use and disposal of plastic. Saeed Sadri (with Professor Richard Thompson) is investigating the photo oxidation and mechanical degradation of floating plastic debris in marine waters that results in their fragmentation into 'microplastic' pieces. In order to assess the level of microplastic contamination worldwide; there is a need for comparable data across marine environments that are based on standard methodologies. Collaborative work between University of Plymouth and the Sir Alister Hardy Foundation for Ocean Science (SAHFOS) has shown a significant increase in the abundance of microplastics captured by the Continuous Plankton Recorder (CPR) in the northeast Atlantic between 1960 and 2000. The aim of this project is to further extend this data set and quantify spatiotemporal variations in the abundance of microplastic debris in ocean surface waters. The preliminary examination of CPR archived samples has confirmed the presence of microplastic debris in European waters (see photo opposite), including the North sea, Irish sea, English Channel and North Atlantic. The most common plastic types were Polyethylene terephtalate (PET) comprising 20 per cent of the samples followed by Nylon 6 per cent and Acrylic 5 per cent. Further work is currently in progress in order to investigate temporal trends in the full dataset. It is hoped that findings of this study will inform several research priorities highlighted by the joint Group of Experts on the Scientific Aspects of Marine Environmental Protection (GESAMP) such as: (a) determining the amount of plastics in the water column; (b) basic mapping of the pelagic/benthic environment; (c) the long-term implications of micro-plastics; and (d) modelling oceanographic parameters (e.g. currents, tides).